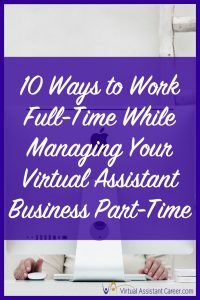 For those of you working full-time while in the startup phase of your VA business, you can work full-time and manage clients. 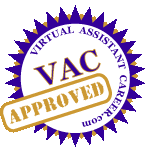 With a solid plan in place you can manage your clients the same as a full-time virtual assistant. 1. When you consider the work you want to offer a potential client, project work is rated higher than on-going tasks, if you’re working full-time. Projects usually have a time period to be completed, which can be finished after normal business hours. 2. When you offer services, only provide the services you can fulfill while working full-time. You can consider subcontracting services, you do not offer to other VAs, but always advise your client when you plan to subcontract out any work. 3. Obtain clients in a different time zone to accommodate your clients’ business hours. You can manage work for your clients by gaining an extra hour. 4. Create a schedule to maintain the workload to keep all your projects and tasks on time. Review the project prior to accepting the work to ensure yourself and the client you have ample time to complete the project. 5. Communication is a key factor in any business. You can communicate with your clients during off times such as, breaks, your lunch hour, or after working hours. 6. Always keep your clients’ projects or tasks with you at all times. When a client needs a project ahead of the scheduled due date, you will be able to deliver the finished project or task at any time of the day. 7. Determine the best time to contact your clients and the best method of communication prior to starting a project or task. This information will assist you when you have to discuss any details and you can reach your clients without losing any time. 8. Set up a daily routine to respond or send emails. When you take the time to concentrate on the information your clients sent you or the scope of your initial email, you eliminate mistakes by not rushing yourself to respond or when sending information to clients. 9. When you receive phone calls during working hours at your current job, let your voice mail take the calls and schedule time to return any calls to your clients. 10. 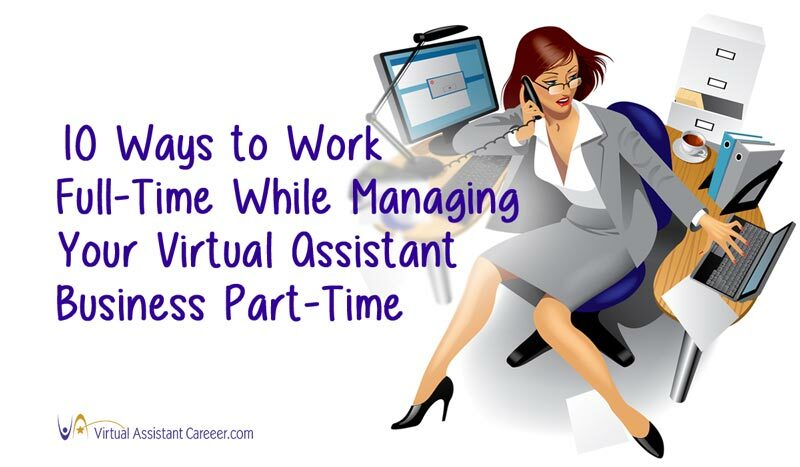 As a part-time virtual assistant, your time and your clients’ time is valuable. By thoroughly checking your finished project or tasks for errors prior to sending the work to your client, you will save valuable time. 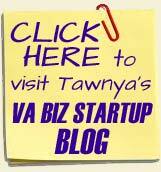 Please share your tips on how you manage to work full-time and part-time in your VA business. 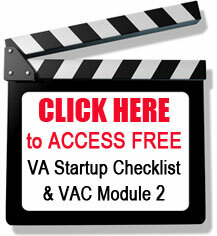 Don’t forget to download our Virtual Assistant Startup Checklist. I love the idea of working only with clients in other time zones. No loss of communication if your “business hours” still align. That’s the beauty of working virtually. I even came across a cool tip at our networking forum the other day to send out my emails with Outlook during business hours. If I am working at 2am (and don’t want clients to know my weird hours) I can delay my email to send out at 8am in the morning. Love this feature with Outlook. Tawnya, just signed up tonight and just learned a great tip – about delaying email delivery. My favority client gets on my case when I send her emails after midnight. But that’s one of the reasons I love being a VA, I can work late at night. I’ll investigate this delayed delivery option in Outlook. Help pls! I looked in all the Outlook/file/help/options, and cannot find anything related to delayed sending of emails. Even looked in “rules” which I don’t really understand. Could someone who knows this trick, please provide us with how-to guidance on delaying email sending? Meanwhile, I have a workaround: I put late night emails in my drafts folder, then send from drafts when I get up the next morning. Google mail allows you to delay sending as well. It’s not quite as straight forward as Outlook, but still a very handy tool. When I help a VA who is starting a business on a thin shoestring budget, this is the most important thing I help them take an honest look at. Take a good look at the free time you have (week and weekend). Divide by 25% The answer is most often the “real” figure of the time you have to put aside for your business. Then take that number and divide again by 25% that is the time you’ll need to market your business and find clients. The rest is time you have to work on projects.